Microsoft today announced it has completed the integration of its enterprise-focused Lync tool into the consumer-based Skype service. As a result, Lync and Skype users around the world can now connect with each other on one unified communications platform. Sign into Skype with a Microsoft account. If you already have a SkypeID, or a Skype contact list you’d like to merge, you can merge the two together during sign-in. If you happen to have multiple Skype accounts, sign in with the Microsoft account you use for work or personal use before connecting it to a SkypeID used for the same purpose. Add Lync contacts by using their email address to search and find them. Once you’ve identified the people you want to connect with and they have accepted your contact request, you can instant message or audio call them and begin talking. Microsoft first announced plans to link the enterprise-focused communications service with the consumer-friendly VoIP and video calling tool in February 2013 at the first conference for its Lync product. The company aimed to have the two services linked before June this year, meaning it has pulled off the feat before its own deadline. The integration was publicly noticeably as early as April 2013, when users started noticing Lync contacts show up in Skype. These were based on Outlook contacts and didn’t require manually adding Lync contacts to a Skype account. Now you can add anyone from Lync to Skype. Lync-Skype connectivity removes barriers created by the rules of different devices, applications and networks that keep people from connecting seamlessly on the devices they use most. By putting people back at the center of the communications experience – instead of the technology they choose to use – we are enabling you to communicate with all the people you care about most using the Skype features that work best– with IM and audio calling – you can now work the way you want to. 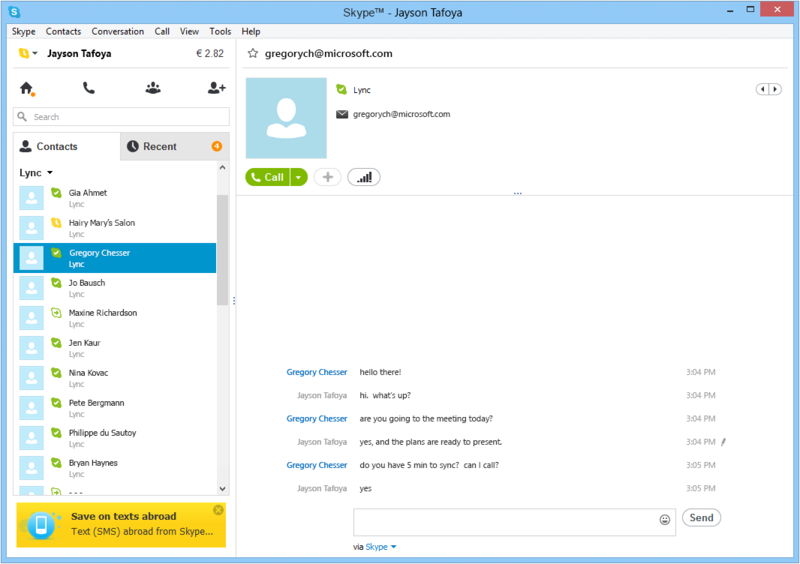 Skype is the standard communications platform at Microsoft now: Messenger has been killed and Lync has been integrated. Yet the company isn’t done yet: we’ll keep you posted as more platforms and features are added.